Mosaics was a popular art form that you could often find that decorated Ancient Roman floors. The Romans used very small colorful pieces of stone and glass to construct very large skillfully done pieces of art on the floors in the private homes of the wealthy and in public buildings as well. Quite often the mosaic would reflect the intended purpose of the room. This is a prime example of a mosaic reflecting the purpose of the room. This type would have have been found in the dining room a wealth Roman. 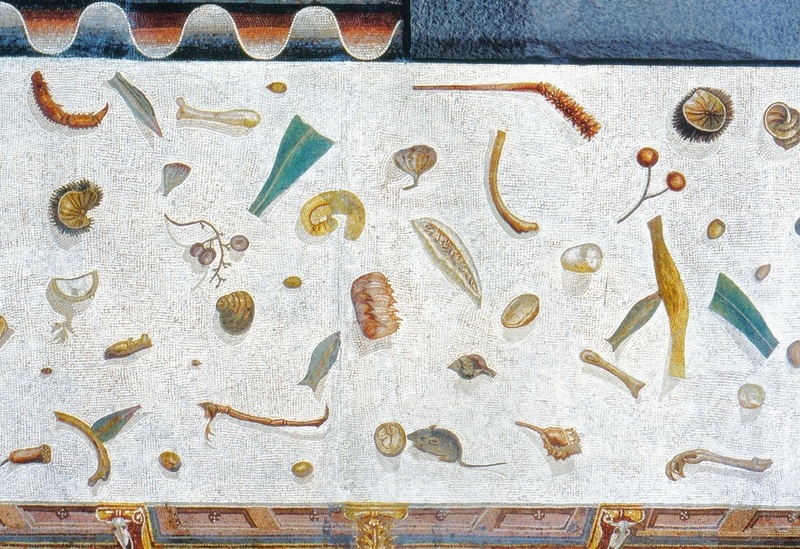 The food on the floor is typical that would have been eaten at Roman feast. This mosaic was found in Hadrian's Villa at Tivoli.